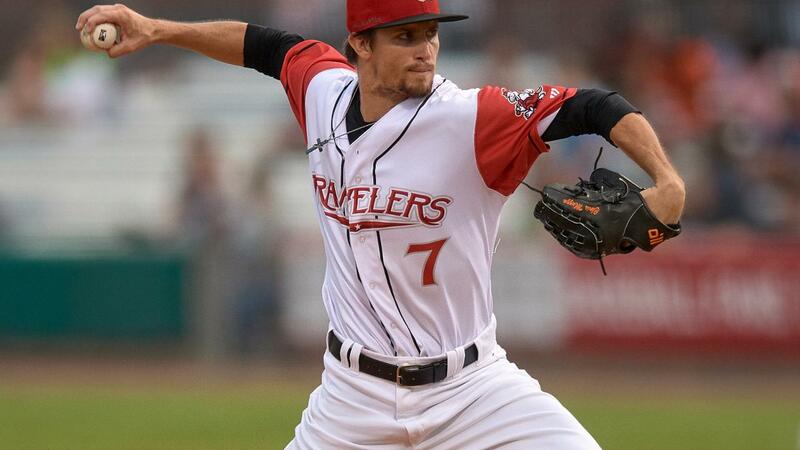 Arkansas Travelers pitcher Chris Mazza was selected as the Texas League Pitcher of the Week for August 27 - September 3. Mazza made two starts during the week going 1-0 with a 1.29 ERA. Over 14 innings he allowed four runs (two earned) on just nine hits and one walk while striking out 11. He earned the win on August 28 at Springfield, pitching seven innings for the victory. On Sunday at NW Arkansas, he again worked seven innings but settled for no decision in an eventual extra inning loss. With Arkansas, Mazza has made four starts, all lasting at least six innings and has not given up more than two runs in any of them, going 1-0 with a 1.33 ERA. He was signed by the Mariners as a minor league free agent in mid-August after pitching in two different independent leagues this summer. At the beginning of the season, the 28-year old native of Walnut Creek, CA was a non-roster invitee to Marlins Major League Spring Training before briefly pitching for Miami's Triple-A and Double-A clubs. He was originally drafted by the Minnesota Twins in the 27th round in 2011. Five other Travs have won league weekly awards this season including outfielders Braden Bishop and Chuck Taylor as well as pitchers Johendi Jiminian, Nathan Bannister and Chase De Jong. Mazza and the Travs open the Texas Leauge North Divison playoff series this Wednesday, September 5 at Dickey-Stephens Park with a 6:10 first pitch against the Tulsa Drillers. For all the latest information or to purchase tickets for Travs games, log on to travs.com.